VersatileDogs.com • View topic - Y’all got’em planted yet? Planted about 2 acres of sunflowers on the 5th. They’re up good and rain moving in today. They’ve got a perfect start and hopefully make a good crop. 6-7 acres of wheat right next to them that’s doing ok and still got one terrace to plant in brown top a few weeks from now. Anyone else jumped on their dove field prep yet? Re: Y’all got’em planted yet? I don't know about dove field, I have been too busy chasing spring turkey, bear and today perch and crappie. I overseeded, limed and fertilized my clover plots. Burned 4 fields of CRP and frost seeded clover in each. Sprayed, fertlized/limed and planted my corn and soybean plots and they are up and going. Will likely need to hot wire the corn and potentially the soybeans or the deer will destroy them. Monitoring that several times a week. Will need at least one more spraying on the corn the beans. Will mow the headed out rye in the clover plots once we are past the nesting and fawn season and will start mowing fire lanes around the CRP fields about the same time. Will start spot spraying thistle in the CRP soon as well. Nothing in my neck of the woods that nests on the ground has a chance. Pastures forages don’t get deep enough, and we’re almost done with the crop of hay already. The few turkeys, that were lucky enough to pick wheat land that will be cut for grain to nest in, better hurry. Will be headed to the fields with the combines in just over two weeks probably. 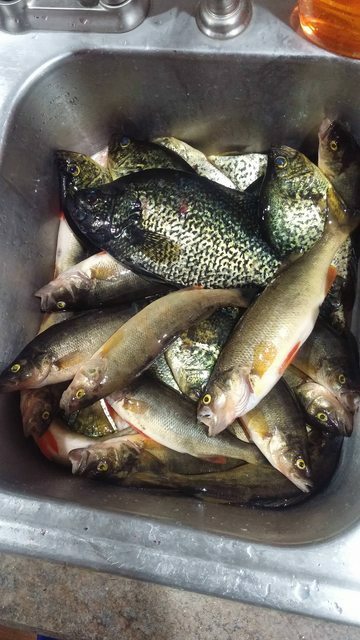 Nice work on the crappie Rowdy! I don’t think I’ve ever caught a perch. Truly don’t know if they’re any around here or not. I hunt a dairy and the are always packed with doves. I do have some sunflower in my yard. one just started blooming and is over 11 feet tall. I post a pic after work. I also have a ton of tomato and peppers. Don't know if I'll get around to planting crops this season. I planted another 40 trees or so this season, mostly Sawtooth Oak, and put drip irrigation on them to make life easier and increase rate of survival. They are supposed to grow pretty fast and drop acorns in about 5-8 years, which should allow me to shoot a few deer and a turkey or two on my property before I am too old to do so. You know the old saying "The best time to plant a tree is yesterday. The second best time is today." JT - The wife and I planted some seedlings in tubes this Spring as well. 25 years ago I bought some Sawtooth oaks through NWTF and planted them in tubes. They were touted to produce acorns in the 5-8 year time frame which is far better than a White Oak or a Post Oak. The Sawtooth Oaks survived well in those tubes and grew to a large size rapidly. I never saw any of them produce an acorn in the 20 years I observed them. No idea why as the trees were large, growing and healthy looking otherwise. Rowdy...... Yum. Way to go. Time for picking not planting. And a little catching too. Stretch wrote: And a little catching too. I am curious, is that basically like a crawdad trap, but for panfish? Looks like a nice haul! And sorry to BE for the hijack... I do love me some dove hunting and crop management. 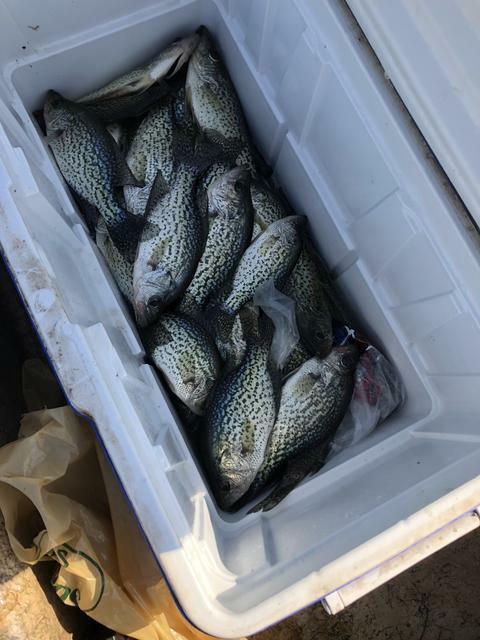 It’s ok. We’ve smashed the crappie this year. Several hundred in the boat. Found two small lakes that are over populated and in need of thinning. So that’s what we did. A plantin thread is now a fishin thread. This young man and his Dad have taken nice adult gobblers off my Farm each of the prior two Springs. 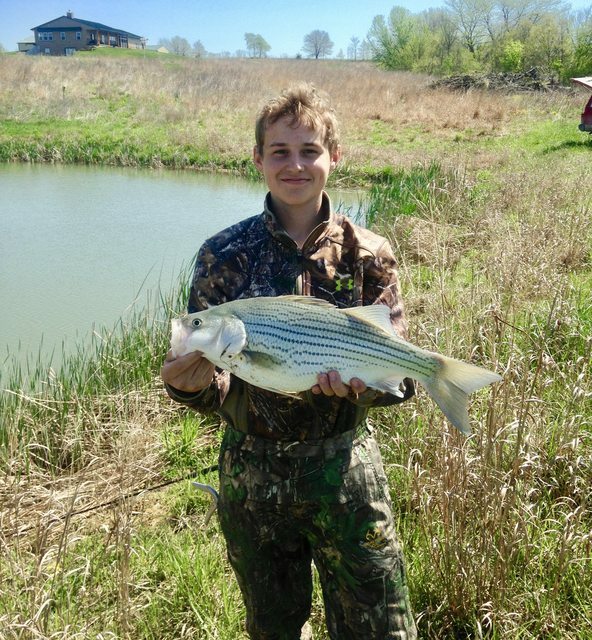 After hunting turkeys that morning, Kale was the first to wet a line in the small pond I had built in the field where the house and buildings are. I stocked it with Minnows, Bluegill and Hybrid White Bass/Stripers 3 years ago and run a feeder on it during the warm months. His first Wiper and he was excited! The kid is ate up for Fishing. Got a kayak for Christmas. No Farm pond fish is safe now. JD Patrick is correct. I use it when fishing ponds, just tie a string to the handle and throw it in. Also will still fit in a bucket when you’re hopping from pond to pond and your fish to stay alive and don’t flop out.